A hypnotic debut in turn-of-the-century Coney Island, where an abandoned girl collides with a disgruntled ménage of circus freaks. 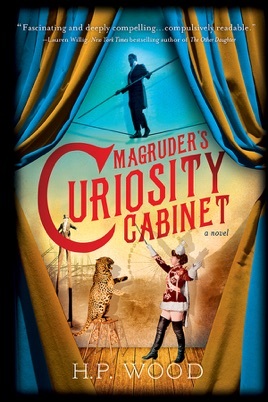 With shades of Water For Elephants and The Museum of Extraordinary Things, Magruder’s Curiosity Cabinet sweeps readers into a mesmerizing world where nothing is as it seems, and where “normal” is the exception to the rule. Coney Island's Dreamland amusement park subculture in 1904 New York City is cleverly dramatized in Wood's debut novel of carnival scams, frauds, hucksters, and sideshow freaks. Seventeen-year-old Kitty Hayward, visiting from London, is alone on Coney Island; her mother is missing, and she has no money or luggage. She falls in with Archie, a shameless con man, who introduces her to the art of the con and the world of sideshow attractions such as Magruder's Curiosity Cabinet, with its elaborate flea circus, shrunken heads, and Robonocchio, the Automatic Boy. Kitty is befriended by Coney Island's Unusuals, the men and women of the sideshows, including the Transparent Man and Zeph, the legless doorman at Magruder's. This fascinating world of rat orchestras and wacky acts is disrupted by an outbreak of pneumonic plague animals and people die quickly and horribly, and Coney Island is quarantined. Kitty and her friends try to help plague victims while searching for her mother, aided by a few Normals; everyone on Coney Island is fighting both the disease and the public's fear and persecution of people who are different. To the panic and chaos, Wood adds a murder, arson, and a diabolical plot to assassinate President Theodore Roosevelt, making this an exciting, fast-paced, and fascinating yarn.